Double Sided Grill & Griddle! Just pay separate $6.95 fee for the BONUS Gotham™ Steel Pan! Check if shipping address is different than billing address. 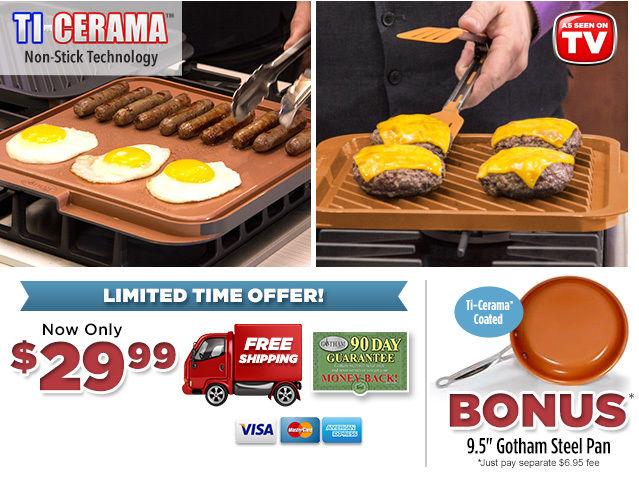 Today when you buy the Gotham™ Steel Double Grill for just $29.99 we'll send you a bonus 9.5" Gotham™ Steel Pan, just pay a separate $6.95 fee. Your order will include FREE Shipping! Sales tax will be applied to all orders from CA, NJ, NY & NV. A $10 shipping surcharge will be applied to all orders from AK/HI. A $20 shipping surcharge will be applied to all orders from PR.